This page answers frequently asked questions about trusts, wills and living wills. It also explains how the Estate Director, a downloadable estate planning guide, can enhance your preparation of these legal documents. What is the difference between a trust, a will and a living will? How is Estate Director unique? How can Estate Director help me? Will Estate Director work on my computer? An ordinary will specifies how your property should be distributed after your death. In the will, you designate an executor, a person who will oversee this distribution. You may also designate guardians for your children or for yourself. In many US states a will must pass through probate court before property can be passed to heirs. The clearer the will, the less time may be needed in court. Because court is often involved, families with special privacy concerns tend to prefer trusts. A living will states your healthcare wishes. It indicates your preferences regarding artificial life support in the case of an illness or injury. A living will may also set limits on how much of your estate may be spent for medical care and funeral costs. A trust may initially be more expensive to draft than a will is, but ultimately it allows for more control, efficiency and privacy. A trust is more flexible than an ordinary will. You can easily make amendments and the trust remains under your direct control until you pass away or otherwise have it turned over to a trustee. Also, because it does not need to pass through probate court, a trust protects family privacy. One common use for trusts is to protect young beneficiaries from their potential to mismanage assets. If you have children who are under 18 years old, then you may want to establish a trust that manages their inherited assets until they reach a contingency age (e.g., 21 or 25 years). Trusts also make it possible for one beneficiary to use an asset before it is passed along to another. 2. How is the Estate Director unique? A typical will or trust isn't designed for maximum clarity and efficiency. 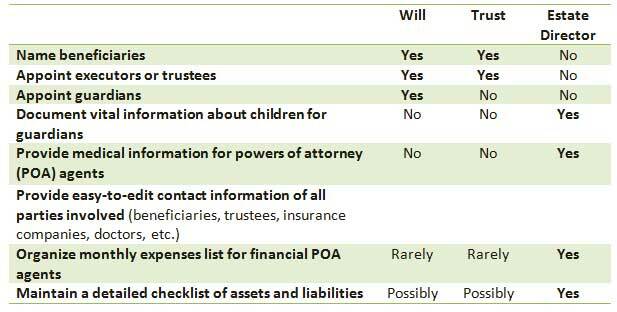 The chart below shows what's included in a will or trust and several examples of how the Estate Director brings added value. 3. How can the Estate Director help me? Whether you plan your estate with or without significant legal assistance, your plans could probably be made more complete - and remember, the more details, the better! The Estate Director calls for dozens of documents that are useful yet often overlooked during estate planning. It also provides an easy way to keep pertinent information organized and easily accessible. If you're working with a lawyer, your contribution to document collection and organization could help you save significantly on legal fees. 4. Will Estate Director work on my computer? Our estate planning guide is available in multiple formats to accommodate old and new computers. Choose a PDF, a Microsoft Word file or an OpenOffice file. A single purchase gives access to all file types. 5. How can I contact you with additional questions? If you have questions about using or downloading Estate Director, please click here to contact us via email.